The past fonts appeared rather illogical in the structure and needed a keyboard for the input. Here a new phonetically accurate font with 36 phonetic characters is presented that can represent 16 * 1024 * 1024 different characters by one sign. Some of them can represent whole words. It is in the following about suggestions, from which can be deviated naturally. Therefore little is concretised, since it concerns the idea. The characters of the primary system consist of ten bits of that four stand for the vowels in the middle part, three for the hierarchic consonants in the left part and three for the grammatical consonants in the right part. The bits are arranged on a circle (top, bottom, left, right) and the circles are abreast. The bits can be arranged also differently. If one or two of the three parts remain empty, one dot is set above beside or over the remaining part in a condensed representation for the identification of the part that is missing in each case, so that one can recognise which parts are missing. However, only the bits are entered that can be set. No sounds are assigned to the dots. All this can be managed by a programme. Each bit is assigned to a finger respectively the thenar. This assignment can be chosen unrestricted, should be however standardised. So thumbs and index fingers for the vowels can be used, the remaining fingers and the thenar for the consonants. If a finger or the thenar is lowered on the desk top, then the associated bit is set. In the primary system, 16 syllables can be represented. To the vowels belong a (corresponds to 4, right), e (1, left), i, o (2, top) and u (bottom), the umlauts ae (5), oe (3), ue and ao (6 as in law) and the diphthongs ai, au, ei, oi, ui (7) and ou (as in low), because these occur frequently. The i consists of a complete circle, for the diphthongs with i the bit of the associated vowel is omitted. The 0 corresponds to y, which is spoken without opening the lips (like hm without m). The (grammatical) consonants in the initial sound are k (1, nouns, personal pronouns), p (2, adverbs, prepositions), l (3, plural), w (4, accusative like ch in German teich), t (5, adjectives), f (6, verbs), s (7, accusative plural) and c (0, links like sh in shoe). The final sound is the same and the real grammatical consonant. The fourth bit is represented by m, which follows in the initial sound after and in the final sound before the consonants. 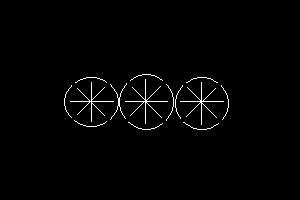 The sounds that cannot be represented with twelve bits are represented with further four bits within the circles (horizontally, perpendicularly and two diagonals). The consonants read g (1), b (2), r (3), x (4 like ch in German buch), d (5), v (6), z (7) and j (0 like j in journal). They correspond to the primary system in the order. The fourth bit is n, which follows in the initial sound after and in the final sound before the consonants. So we have again twelve bits, to which one switches, as all ten fingers respectively the thenars are lowered on the desk top. If the bits should not be sufficient, further ones can be added. They can be "written" with the feet or elbows or knees. Ersatz consonants are h (like th in thin) and q (like th in the). Bit combinations with m or n can be spoken also as other sounds: e.g. xn like the hitherto h, dn such as English th and so on. If mankind should succeed to be able to use the thoughts in the brain, - it is with additional technology - this is omitted. Then less characters than complete pictures are thought, and these are converted in characters. Since whole words can be written at once, a clear speed increase is to be expected. However, the complete character set cannot be exploited completely, since, because of the danger of mix-ups, sufficient gaps must remain (thin allocation). The conversion for blind persons is likewise simple. Additionally deaf-mutes can communicate with the hands (and fingertips). Since one is substantially faster with the keyboard, as long as parallel processing is too difficult for man, it is to focus in the following on the keyboard and the dependence on the phonetic transcription (a character - a sound). The conventional characters are more eidetic than the bit combinations and thus easier catchy (maintaining of history). The "keyboard" could consist of a "data glove" that determines the correct "key" from the relative movement of the fingers. So substantially more "keys" could be mapped. Furthermore, the "keys" could be rearranged by considering the frequency of the characters and/or letters. As long as there is no unitary language, customisable country versions are here useful. The "keyboard" can be specified by three-dimensional holography or two-dimensional laser light.